http://www.cajunfirst.com/news/local-news/ldwf-agents-conducting-search-and-rescue-missions-in-south-louisiana. Glenn Farley of KING TV overlayed the Louisiana flood area on a map of Washington State. It covers an area from Seattle to Grand Coulee Dam, and from Everett south to Tacoma. s we look at the world of search and rescue, we need to admit that SAR is really a collection of disciplines and skills, and we are bonded to many more brothers and sisters than might be obvious. Who among us would be prepared for a SAR mission in which an enemy was trying to kill both our subject and ourselves? Yet that is a given in the world of military search and rescue. If you’re in the Coast Guard, the ocean is usually trying to kill everyone involved, and that’s a much different dynamic than looking for a lost mushroom picker in a old-growth forest. 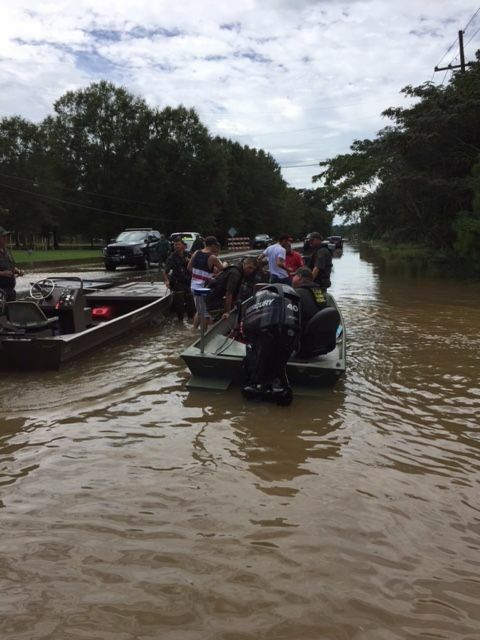 In Louisiana there are currently many search and rescue missions which involve anyone with a boat. We wish them Godspeed as they work to save people from massive flooding. Even firefighters at routine house fires do search-and-rescue, by circling the interior of burning buildings while keeping one hand on a wall. Within our world of search and rescue we have trailing, air scent, cadaver, water search. We have counterparts in mantracking, 4×4, snow machine, mountain rescue and much more. If you’re in SAR you’re part of a much larger fraternity than you might have known. All of us working together to save lives, one subject at a time. So take heart and be proud of your accomplishments. You’ve earned that.